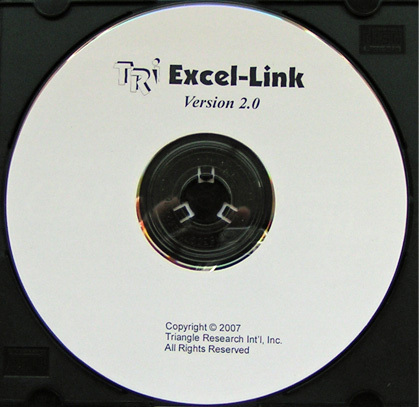 The TRi-ExcelLink software provide you an extremly simple-to-use, two-way linkage of data between the PLCs and an MS Excel* spreadsheet. It is an application software that works in tandem with the TLServer program (this is included in your Internet TRiLOGI Version 5 or 6) or work with the Ethernet port on PLC models that are so equipped . Hence, not only can you capture PLC data directly from the local PC running both the TLServer and ExcelLink program, you can also simultaneously capture data from up to 16 TLServers or Ethernet PLC that are connected to the LAN or the Internet. Note: You can also use the TRi-ExcelLink software to collect data from third party equipment , including other brands of PLCs by using a Super PLC as a "bridge" to interface to those equipment via serial or parallel I/Os. E.g. Since an M-series or Nano-10 PLC can speak MODBUS and OMRON protocols they are ready to communicate with MODBUS RTUs or OMRON PLCs to capture the required information. With the power of TBASIC, you can also program a Super PLC (yes, even via the Internet) to churn out whatever unique communication protocols to speak to other types of equipment. For those equipment without a host communication protocol, you can also use the Super PLC's vast array of digital or analog I/Os to collect data from them and make them accessible to the Excel spreadsheet via the Internet.